Long-term average number of tropical cyclones, using data from the 1969–70 season to this ( ) season. Tropical cyclone season outlooks are issued in the second week of October each year. This outlook uses the statistical relationships between tropical cyclone numbers and two indicators: the Southern Oscillation Index (SOI) and the Niño3.4 sea surface temperature anomaly. These two indicators provide a measure of the atmospheric and oceanic state, respectively, of El Niño-Southern Oscillation (ENSO). The July, August and September SOI and NINO3.4 values were used in making the tropical cyclone season outlook. Percentages such as a 60% chance of having more tropical cyclones than average (or a 40% chance of having fewer) mean that for every ten years with similar climate patterns to those currently observed, six years would be expected to have an above-average number of tropical cyclones and four years would be expected to have a below-average number. The long-term average number of tropical cyclones per season in the Australian region (since 1969–70) is eleven, with four typically making landfall. Since the year 2000, there have been an average of nine tropical cyclones in the Australian region each season. During El Niño events, there are typically less tropical cyclones than average, while more tend to occur during La Niña events. As always, it is essential that all local communities prepare for the cyclone season regardless of the outlook. Over the entire Australian Region, this statistical relationship has proven to be highly accurate, or a skilful way to forecast tropical cyclone activity. However, across the sub-regions this relationship, and thus forecast skill, can vary. Some regions have much higher forecast skill than others. The Northwestern sub-region has good skill, while the Western and Eastern regions both have low skill and the Northern region has very low skill. Model: Kuleshov, Y., L. Qi, R. Fawcett and D. Jones, 2008: Improving preparedness to natural hazards: Tropical cyclone prediction for the Southern Hemisphere, in Advances in Geosciences, 12 Ocean Science, (Ed. Gan, J. ), World Scientific Publishing, Singapore, 127-143. Data: Kuleshov, Y., R. Fawcett, L. Qi, B. Trewin, D. Jones, J. McBride and H. Ramsay, 2010: Trends in tropical cyclones in the South Indian Ocean and the South Pacific Ocean, Journal of Geophysical Research 115, D01101, doi:10.1029/2009JD012372. The possible development of El Niño in the tropical Pacific Ocean and near average ocean temperatures to the north and east of Australia have influenced this year’s tropical cyclone outlook. On average, there are 10 to 13 tropical cyclones each season in the Australian region, four of which typically cross the coast. El Niño typically reduces the number of coastal crossings, but at least one tropical cyclone has crossed the Australian coast each season since reliable records began in the 1970s. During El Niño years, the first tropical cyclone to cross the coast is typically during the second week of January. This is generally later than seasons which are ENSO-neutral when the first cyclone landfall typically occurs in late December. Cyclone formation is rarely spread evenly throughout the season; often quiet periods are followed by bursts of activity. Tropical lows that do not intensify into cyclones, or lows that are the remnants of older cyclones, can still cause widespread rainfall and dangerous flooding. These impacts can extend beyond the tropics into southern areas of the country. The Australian region has a 37% chance of more tropical cyclones than average, meaning a 63% chance of less tropical cyclones than average. Typically, around four tropical cyclones cross the Australian coast in a season. Outlook accuracy for the Australian region is high. The Western region is likely to experience a below-average number of tropical cyclones this season, with a 56% likelihood of fewer than average. The likelihood of more cyclones than average is at 44%. Typically between about 15% and 40% of tropical cyclones in the Western region affect coastal areas. Outlook accuracy for the Western region is low. The Northwestern sub-region has a 41% chance of more tropical cyclones than average and a 59% chance of fewer tropical cyclones than average. Typically, five cyclones form in or pass through this area each season. Around 40% of tropical cyclones, or their associated tropical lows, affect coastal areas of the Northwestern sub-region. Outlook accuracy for this region is moderate. The outlook for the Northern region suggests an average number of tropical cyclones with a 46% chance of more than average and a 54% chance of fewer tropical cyclones than average. In a typical year the Northern region experiences around three cyclones, and one or two tropical lows that later become cyclones after moving into the Western or Eastern regions. About three-quarters of the tropical cyclones in the Northern region impact coastal regions. Outlook accuracy for this region is very low. 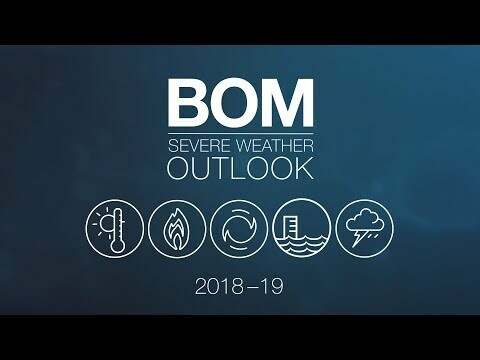 The Eastern region outlook shows a below-average season is most likely, with a 40% chance of more tropical cyclones than average and a 60% chance of fewer. About a quarter of tropical cyclones in the Eastern region make landfall. Outlook accuracy for this region is low.